NOTE - We have detected that you are browsing our site from the USA. BWIN does NOT accept poker players located in the USA. To play online poker, please view our list of the best USA poker sites. Bwin began life as a sportsbook with just 12 employees back in 1997, however the company has seen massive growth from the very start. Originally known as BetandWin, the company rebranded in 2006 to Bwin, the new name more reflective of the much broader range of gambling available. In 2011, Bwin and Party Gaming merged to become one of the true powerhouses of online gambling, of which poker plays a huge role. Bwin Poker is the #1 room on the OnGame Network. The poker room offers casino, sports betting and poker in one, with a $200 bonus for new players. Join Bwin Poker through our site using the links below and receive a 100% match bonus on your first deposit. Bwin Poker has implemented a brand new rewards system for regular players. Want to check out a live sporting event, or take part in a tournament? Redeem your player points for free tickets. for a 100% up to $200 Bonus! The merger with Party Poker saw Bwin make the move onto the very popular Party Poker network. As well as welcome deposit bonus, players will also enjoy a wide range of promotions including a loyalty scheme where earned points can be converted into cash, cash games bonuses if you play between 4 and 7 times a week, freerolls and more. Upon registering at Bwin poker, players can enjoy a 100% deposit bonus of up to €100, but the bonuses don’t stop there. The loyalty scheme has green, white and yellow tiers and as you move up you’ll gain increasing numbers of opportunities to win prizes such as additional bonuses and tournament tickets. Missions are all the rage at poker sites today and Bwin has joined the party with 13 missions for new players, with the opportunity of winning more than $25 in rewards. You do not need a bonus code for this bonus. Use the links on this page to receive the offer. Players at Bwin, can access the tables from a wide variety of devices. This includes a very popular download version, the option to play within a browser and mobile gaming options too. Bwin poker has a slick black and yellow color scheme which gives the lobby a very professional and modern feel. While navigation between cash games, tournaments, sit and goes and all the other poker variations is a simple one click affair. 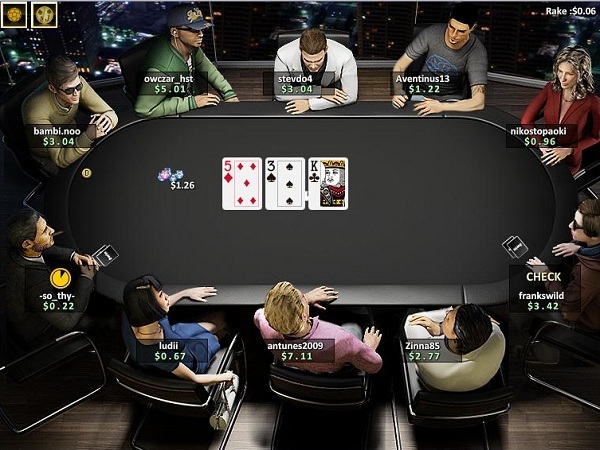 Players will find a number of options, including the ability to upload their own avatar, choose their own table style and set up auto buy-in options. At first, it might seem that the site is set up for the more recreational poker player, but when you delve fully into all the options, there is plenty for the professional player to get their teeth into. This includes detailed multi-tabling options, as well as multi-monitor support. The gameplay itself is smooth, while the graphics can be eye-catching especially when the avatars are in play, although this will depend upon exactly which set up you choose to use – some players enjoy a more basic look. The range of poker tournaments are wide and varied, catering for both the high rollers and the recreational players alike. The biggest even by far is the £6 million guaranteed, multi day live poker tournament which players can qualify for online in a series of satellites. The $100,000 guaranteed Super High Roller tournament has a buy-in of $2,600 and is the joined by the high roller tournament which has the same guaranteed $100,000 but a smaller buy-in of $530. Tournaments run 24 hours a day and the buy-ins range all the way from these high roller tournaments to freerolls, so there really is something for everyone. The amount of traffic at Bwin poker changes throughout the day - with evenings and weekends in Europe seeing the site at its busiest. Players won’t have any trouble at all in finding a cash game when playing hold’em, but might struggle a little at other variations available, such as Omaha and 7 Card Stud, especially at the higher stake levels. Being a European based site, you’ll find the deposit options very wide ranging at Bwin. Debit and credit cards such as MasterCard and Visa are always popular, while e-wallets such as PayPal, Skrill and Neteller are also available. Other options include WebMoney, PaySafeCard and Diners Club Card. There are a number of bank transfer options available, including a bank wire, instant banking and an electronic transfer. The customer support services at Bwin can all be found in the ‘contact’ page. Here you’ll find a drop down list of subjects which will immediately bring up a number of FAQ’s regarding your chosen topics. The FAQ database is wide ranging, so in most cases you’ll simply find the answer you are looking for in here. If you’re still having trouble, there are a number of other options. The most straightforward of these is via the live chat window. Click this and an operator will be with you shortly and they’ll guide you through whatever problem you have. There is a further ‘help’ section, which will bring up another window and gives added information about your account. If you like to speak to somebody, you can call the team seven days a week between the hours of 10am and 10pm. On the contact page, you’ll also find a form to send the support team an e-mail. For those who prefer snail mail, a postal address is also supplied. Ready to Play? Visit Bwin Poker to Get Started Now! Ready to join? Use this link to sign up to Bwin Poker and receive a 100% bonus up to $200 on your first deposit. No bonus code is required. Reload bonuses are available on a weekly basis and you will also receive promotions geared towards the Bwin Casino and Sports Book.